The emerging Dutch ensemble VONK takes a unique middle road between contemporary classical and indie pop, with soprano, clarinet, saxophone and percussion. Think somewhere between David Lang and My Brightest Diamond, with here and there an extra unexpected twist. Songs for VONK dares composers and songwriters to write a new programme together around the theme of ‘evolution’. Nicoline Soeter, Brechtje, Molly Joyce and Liesa Van der Aa will rise to the challenge and present some unruly pop songs for the late-night hours. Composer Nicoline Soeter has developed as a multidisciplinary artist the past few years, focusing on the correlation between music and text. In 2016/2017, she was supported by New Arrivals. Soeter has been commissioned by the Fonds Podiumkunsten, festival Wintertuin, November Music, Cultura Nova and Transit, among others. Her works have been performed at various festivals and concert venues, such as November Music, Cross-linx and the Gaudeamus Music Week, and is published by Donemus Publishing. Liesa Van der Aa (°1986) is a violinist, composer and actress – a young artist generally performing solo. She’s worked on several musical projects featuring violin and voice, and has composed for – and acted in – several ensembles, theatre productions and movies such as Toneelhuis, deSingel and Ictus Ensemble. Liesa’s musical investigations are continuous sound experiments, stemming from her classical violin: a clash – on occasions a meeting – of baroque, classical music and soundscapes. Brechtje (°1993) is a Dutch composer and singer, living in Amsterdam, who graduated in composition at the Conservatory of Amsterdam in 2017. She is a true musical omnivore, with a passion for South-Indian rhythms, Stravinsky and Zappaesque rock. Over 100 of her compositions have been commissioned and programmed by a.o. NJO Muziekzomer, Grachtenfestival and Platzhirsch Festival (DE). She’s a driving force behind many projects, and is the artistic leader of the Rodeo of Wonder foundation. 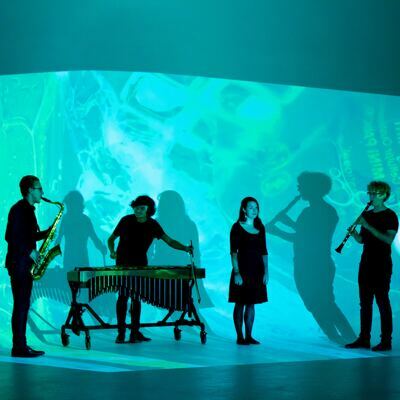 Four musicians and a composer cooperate to create new productions in VONK. The ensemble has a unique sound because of its original combination of soprano, saxophone, clarinet and percussion. Open-minded and boundary-breaking, the ensemble has built up a new repertoire since its founding in 2015. The interaction between composer and musicians lend both the creative process as well as the joy of playing a great deal of energy. In 2016 VONK presented its first Music Theatre production called Wunderkammer, written by Nicoline Soeter, which premiered at November Music.